2014 Zatopek Week 3 with Trail Race debut! This week was largely about getting rid of this calf injury and building up the running again. I was pleased it healed very suddenly towards the end of the week and I could do the trail run on Sunday – albeit only the 20km, and not the 30km option I had initially intended to do. Hopefully now I can push on and train properly again! Monday – 35 mins easy. Calf wasn’t too sore, but uncomfortable. Probably a 3-4/10 on the pain scale but was starting to get slightly worse towards the end. Tuesday – REST. Gave the calf another day to recover. Wednesday – 35 mins easy. A slight improvement on Monday. Didn’t get worse as run went on. 3/10 for pain. Thursday – 35 mins easy to compare to yesterday. Exactly the same, so not getting worse. Friday – 45mins easy. No pain! All of a sudden it seems to have pretty much disappeared. Could even run close to 6min miling towards the end feeling fine. Saturday – 65mins steady. Zero pain again. Excellent! Running along the Sandy Trails of Botany Bay! along here, as it was so narrow, and slightly uneven underfoot. There was a pretty tough section up a sand dune but after that it was pretty good going. I didn’t push the pace and just focussed on following the pink tape in the bushes, which wasn’t always easy to spot! I got a bit of a gap as the race went on, but lost almost all of it as I followed someone from the 30km race which started before me who had gone the wrong way right at the end of the loop and so I actually ran straight past the finish line! I think I did an extra 800m or so but managed to just finish in front, gaining $200 for a narrow 20 second victory. The calf gave me no problems at all which is the important thing and Amelia outsprinted an old man which was exciting to watch! Weekly mileage: 55 miles. Time to crack on! 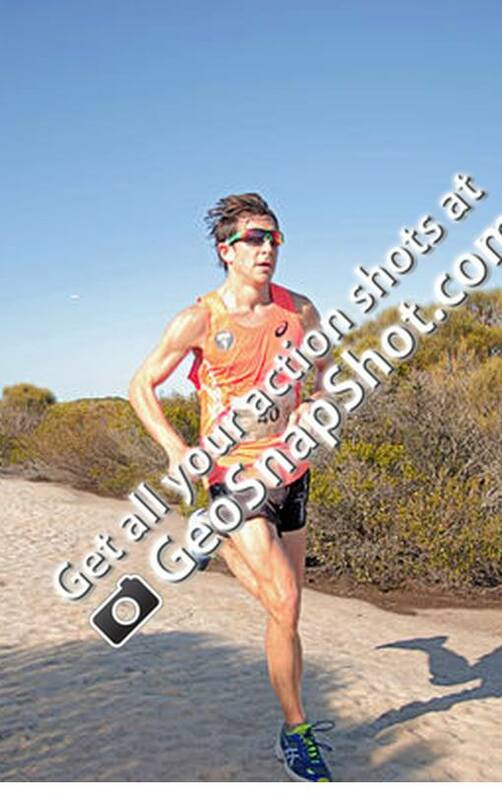 This entry was posted in Training, Zatopek 2014 and tagged Botany Bay Trail Series by benjimoreau. Bookmark the permalink. I out-sprinted a similarly-aged woman, thank you very much.